Exhaust - Remove Muffler and add new pipe. 1 3/4 inch attach line for rear. 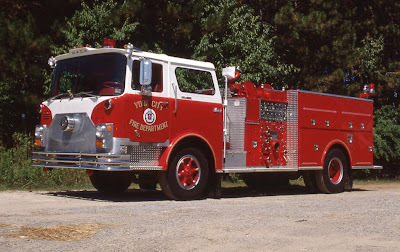 Thanks to some of the people on FirePics.net I found out that this engine was refurbished by JC Moore in 1991. 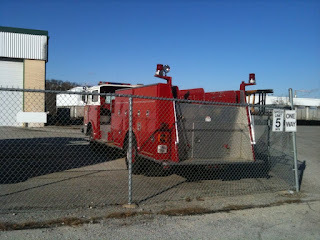 Here is a picture of it before the refurb running as Engine 7. Here is a picture someone sent me after the refurb. Well after a long day we got it home. Started at 9:30 this morning out at the city sewer plant with Lt. Behler and Kevin Gibney. First it wouldn't start. We tried to jump start it. No dice. We tried to put a battery charger booster on it. No go. So I decided that it was time to replace the 4 year old batteries. Went and bought 4 new batteries and installed them with help from the guys from the sewer department. It turned over but from sitting for 4 months and being 20 degrees outside it would not fire up after many tries. Kevin was able to call some guys he knows and they suggested that we put some ether in the intake. Lt. Behler showed up with the starter fluid and with one little spray it fired right up. We let it idle for a while and down Rt. 30 we go. Once we got it home Kevin said it drives and shifts real nice. So he and I went out for a little ride so I could try working the 5 speed manual transmission. It was so much fun! Can't wait for warmer weather. After months of bidding and negotiating with the City of York Fire Rescue I received a phone call today letting me know that I was the high bidder for their 1972 Mack CF Pumper. Now the fun begins. Many things to do to get it insured, registered and in storage for the winter. I will post pictures once we get it home and start on a list of what I need to get done to get it parade ready!